This little-known historical gem is located deep in Wales's border country, today a tranquil landscape but in medieval times hotly disputed territory. 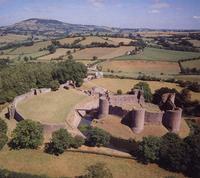 Along with Skenfrith and Grosmont, White Castle was one of a triangle of fortresses - the "Three Castles" - initially built to control a strategic entry point into Wales. Its name refers to its original colour. When built, the masonry, now exposed to the elements, would have been rendered with gleaming white plaster, patches of which can still be seen. White Castle, which started life as a simple earthwork stronghold soon after the Norman Conquest, was rebuilt in stone in the later 12th and 13th centuries. Granted to Hubert de Burgh by King John in 1201, the castle convincingly conjures up a romantic vision of the Middle Ages. There is a large and now grassy outer ward enclosed by walls and towers, but it is the self-contained and well preserved inner ward that captures the imagination. Powerful round towers and high curtain walls, built on a steep earthen mound encircled by a deep, water-filled moat, guard the heart of the castle. Visitors cross a bridge over the water to enter the inner ward, and can ascend the gatehouse for superb views of the castle defences as well as the surrounding, rolling countryside and Skirrid mountain. Throughout its history White Castle seems to have fulfilled more of a military role than evolving into a nobleman's residence. During World War Two Hitler's deputy, Rudolph Hess was held at a nearby mental hospital and occasionally fed the swans in the castle moat. Just south-east of the castle is Hen Gwrt (Old Court), an interesting medieval moated site. By minor roads from B4233 near Llantilio Crossenny.